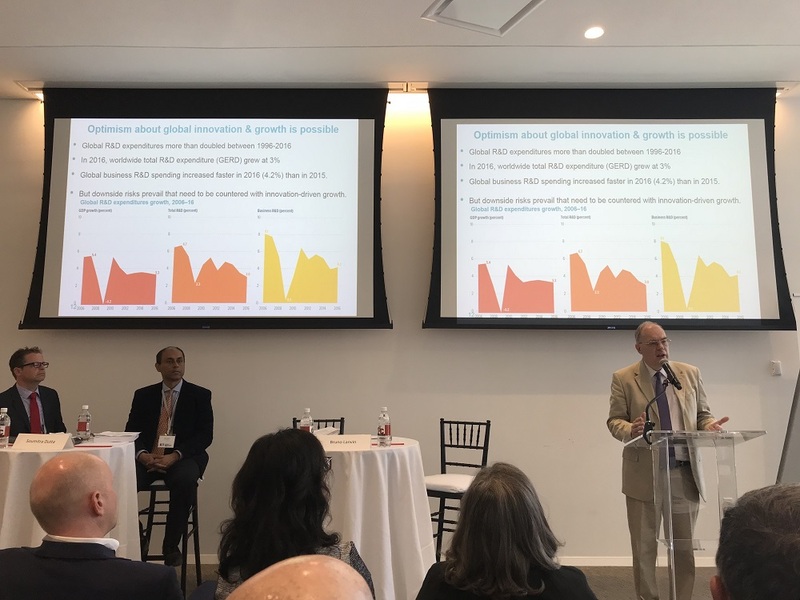 NEW YORK — The 11th edition of the Global Innovation Index 2018 (GII), co-published by Cornell University, INSEAD, and the World Intellectual Property Organization, was released yesterday at a launch event in New York. This year’s report showed Switzerland still at the top overall, China continuing to rise, the United States slipping, and explored how countries can vary on inputs and outputs of innovation. One highlight of the GII 2018 is the rise of China to number 17 in 2018, from number 22 in 2017. This represents a significant breakthrough because China is the only middle-income country to enter the top 20 most innovative economies, WIPO Director General Francis Gurry told a press briefing in New York yesterday. Also significant is that the United States dropped out of the GII top five to number 6 in 2018, from number 4 in 2017. The theme of this year’s report is “Energizing the World with Innovation,” and the launch event featured a panel discussion on important innovations in the energy sector. The launch event also included a presentation and two panel discussions on “Innovation in the Americas – challenges and opportunities for competitive growth,” with a focus on Brazil. The GII rankings are calculated by averaging performance on two sub-indices of innovation input and innovation output. “The Innovation Input Sub-Index gauges elements of the national economy which embody innovative activities,” and the “Innovation Output Sub-Index captures actual evidence of innovation results,” according to the press release. It was pointed out that Singapore is number one on inputs, but nowhere near the top on outputs. “Countries sometimes are not receiving the full reward of their innovations,” said Bruno Lanvin, executive director of global indices at INSEAD (and an IP-Watch Board member), in presenting the report. Separately, while the United Kingdom came in at number 4, it was noted that the data do not yet include any effect of Brexit. Two-thirds of the data for this year’s report is from 2016, one-third from 2017, a speaker said. While the GII rankings are normalized according to GDP, in order to enable comparison of economies with different levels of income, Dutta explained, there continues to be a significant correlation between level of country income and GII rank. These disparities are reflected in the fact that the top 20 most innovative economies are “still quite Euro-focused,” noted Sacha Wunsch-Vincent, head of section for the Economics and Statistics Division of WIPO. Yet, he said, there is reason for optimism. When you look into the GII data, “some countries just over-perform for their level of development, so they’re not in the top 20, they’re not in the top 30, but they do something that other countries can definitely learn from, and that will help overcome these regional imbalances,” Wunsch-Vincent said. The Global Innovation Index has been published annually since 2007, and “is now a leading benchmarking tool for business executives, policy makers and others seeking insight into the state of innovation around the world,” states the press release. "Global Innovation Index 2018: China Breaks Into Top 20, US Drops Out Of Top 5" by Intellectual Property Watch is licensed under a Creative Commons Attribution-NonCommercial-ShareAlike 4.0 International License.